It was not too long ago when contracts were made on a handshake and a promise. Individuals were not particularly concerned with things like insurance because they relied upon the goodwill of their neighbor to compensate them for wrongful damage. For a variety of reasons, including an increase in the speed and cost of auto wrecks, auto insurance soon became an important purchase for responsible individuals. Not long after, the federal government mandated that auto insurance be carried, at least minimally, by all car owners. The increase in the need for auto insurance over the last 10 years has led to increases in the complexity of insurance, while at the same time, amplifying the need to be more cost conscious in auto insurance purchases. 1. Portray yourself as a ‘safe’ candidate: Insurance companies are interested in managing risk. Consequently they offer drivers who are less likely to get into wrecks or at a minimum into wrecks of less severity, a lower insurance quote. -Maintain a clean driving record, free of traffic violations or accident claims. -Install anti-theft devices in your vehicle. -Attend a Drivers Safety Training program. -Buy a ‘safe’ vehicle. The National Highway Traffic Safety Administration (NHTSA) and The Insurance Institute for Highway Safety together collect information on safety related aspects of different vehicles. Buy an automobile that is officially designated as ‘safe’. -Park your vehicle in a garage. 2. Show your Credit worthiness: As a risk management entity, insurance companies are also worried about getting paid on time. If you can show yourself to be credit worthy, there is less risk of you not making your payments on time, thus warranting a lower rate. -Maintain a good credit score and clear up any errors on your credit. -Cut down on the total number of outstanding credit cards to 2 or 3. 3. Practice Financial Wisdom: The way in which you structure and pay for your policy can lower the risk that an insurance company faces with respect to you as a customer. By taking steps to lower their risk, you receive a lower insurance quote and policy. -Buy an annual policy instead of a six monthly coverage to get you a lower rate that remains the same for a year. -Opt for automatic payment deductions from your bank account or your credit card to avoid getting charged for mail payments. -Increase your deductibles on comprehensive and collision policies to reduce on the rates. -Get loyalty discounts by buying your home and auto insurance from the same company. 4. Assess your Insurance Needs accurately: This is obvious, the more coverage you get the more it will cost you. Add-ons are killers in the insurance business, strip your policy down to just the minimum of what you need. -If your vehicle is not used much or you have an old car with little market value, opt for minimum liability alone. It will cost you less. -After fulfilling the legal mandate on auto insurance, insure according to your needs alone. 5. 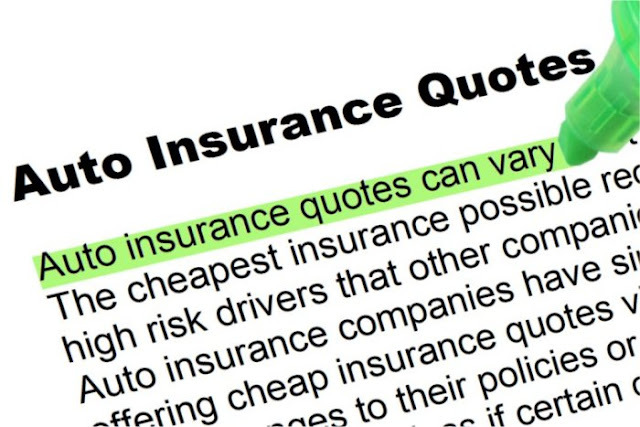 Other wise things that you can do: There are a number of other considerations that go into your insurance quote. Some of them are not reasonable steps to take, while others you can do with little effort which can translate into substantial savings. -If your car is used only for a particular purpose, make your agent aware of it, as this will limit the cost. -Students that make good grades are often eligible for a discount. -Give up smoking; it can help you get better quotes. -Change your occupation if you can help. A delivery boy carries a higher risk than a storekeeper.